Dino-x does exactly nothing. I dropped some dino x on them under a microscope and they liked it! Are these the ones your previous post says do the 'ostreopsis whirl'? I had a definite id on my 2ndary dinos until I noticed that the reference pic for the spp was at 1000X and my species was at 100X. Close..but not quite. yep, their normal mode of movement is the whirl like what is usually described for ostreopsis. I really would like an answer for this question. Does dipping a coral and rock in a coral dip solution do anything to dino's? I think people have dipped in some solution of hydrogen peroxide to kill dinos and microalgae directly. Can't speak to how corals respond to the dip. I am asking for sharing of frags purposes. I certainly don't want to infect other tanks or introduce more dino's into my own tank. So does dipping corals in a coral dip like Seachem coral dip or lugols before putting them into the tank prevent or kill the dino's? Or does anyone do a fresh water dip before adding new corals to a QT or display? 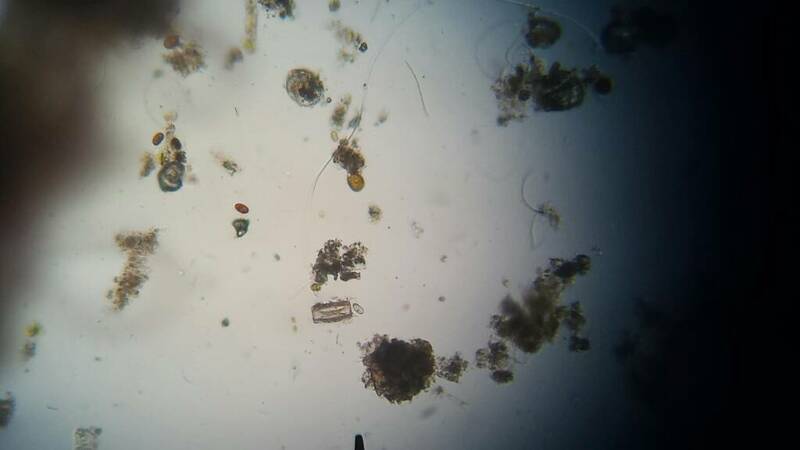 This picture is from a tank we all know and what it says is that all the corals and equipment in the world will not free you from dinoflagellates. Looking at more recent pictures it looks like he is stuck with them, just like us. Last edited by DNA; 01/30/2016 at 08:36 AM. Nature has dinos too. It also has ebola. There are pathogens - we are never "free" of them. But that doesn't mean that life is doom and gloom. Let's inject some hope. I recently had a small resurgence of a patch of dinos coincident with a coral death. The coral was encrusting but had thick porous tissue (monti spongodes) and had been growing on the rock until another parasite (monti nudi) killed it. I couldn't remove it, so it was decaying in place. This was frustrating. As soon as the predators would come out to eat them, they'd disappear into the water column. By day, the fish were awake and the pods were hiding. So the dinos rematerialized in the same area. My enemy's enemy, I guess. I used some superglue to cover up the area, but they found enough little gaps to continue to feed on the rock infused coral carcass. THEN - I noticed a little patch on another rock in my low flow area where I had accidentally bumped my polyp rock against it - leaving some dead coral residue. Same activity - pods at night = dino disappear. pods hiding by day = dino reappear to feed on dead coral region. The area was difficult to access, so I couldn't clean up the residue. So - I turned up my UV from 6 hours at night to 24/7! A week later, both regions are clear. I can't be sure of all my cause-effect conclusions, but the facts are the facts. You can draw your own conclusions. Agreed, it's not that direct, not that magic. this thread wouldn't be here if it was. I've also been messing around with adding micro-life. I took skimmate, poured it in a bottle with a very slow air bubbler, set it in the sun during day and 2700k light at night. After a day and a half the mix had gone from brown to a light green. Two tiny beakers with dino sand and tank water from the back of my tank (amphidinium) so each had 20 ml. One I added 10 ml more of tank water (control) and the other I added 10 ml of my sun-treated skimmer "green tea". I watched them to see who would "win" between the microlife and the dinos. the dino population didn't change in a dramatic way, but the microlife really continued to progress. After 48 hours (lit around clock day 1, lit during day, dark at night for day 2) this is what a representative sample of each looked like under the microscope. skimmer "green tea" batch: still dinos also, but they are outnumbered 10-100 to 1 by other micro-life of many different sizes - nothing pod sized was seen. If moving sandbed far far away from a Dino monoculture is a key to treatment, then this is good to see. I'm repeating the experiment on a gallon-size scale, while still watching the small beakers. If things progress along these lines, I'll start dumping sun cooked skimmer "green tea" into the tank sandbed. Nice to see someone else doing tests! I don't think you are that new!!. How about a youtube update. I love you videos!!. After 72hr update. Today it was a dramatic change. The control beaker was still majority dinos. The beaker with the "green tea" added had almost no dinos. I had to take sample after sample to find any at all. The biggest concentration I could find in 10+ samples was this one with 4 whole dinos. I if the 1 gallon test is following the lines of the beakers tomorrow I might accelerate starting this in my main tank. The beaker with the "green tea" added had almost no dinos. Now we have to have theories on what is really going on. I think that dinos can't tolerate their own toxins and it to be the regulating factor on their population densities. I also think it is likely that they have no control over it and it is simply released when they die and come apart. In the skimmate are loads of dead dinos. In one of my tests I siphoned the dinos off the sandbed and added them later with "good" results. Most of my dinos died and so did a few of my fish. If this is true your green tea killing effect could be palytoxin rather than devouring organisms. I like your tests, a lot. Last edited by DNA; 01/31/2016 at 01:54 AM. We have been discussing dinos here fo a few years with some progress, but we have not come up with any means of repeatable method that is certain to get dinos under acceptable control. We have probably shed more light on them than anyone else anywhere and should be proud of that. There are loads of reefers with this problem and they don't have a clue. They can't keep SPS corals and just keep buying new ones or get out of the hobby out of frustration. They are for sure in their hundreds if not thousands in any give time so uniting them in the hunt is a good idea. I've written to a dozen of scientists and none of them even bothers to reply. It's raining up their noses and their knowledge is usually only good for an extremely narrow field. We are in prime position with our infected reef tanks to do all kinds of test and here is the spot to share them. We need thinkers and doers and the hobby free of this pest. To recruit and unite them we need marketing. ... your green tea killing effect could be palytoxin rather than devouring organisms. I hope your theory is right. That would be some delicious Shakespearean level irony. I'm not a bio or chem person (physics degree) so my guesses may not be grounded in much, but here's my thoughts behind the tests. 1. Why do dinos make toxins and have chemical/physical methods for collecting together in such close quarters (chemical markers for their territory, mucous mats, attaching in strands)? Wouldn't spreading out be better? Because they are weak! They can't thrive in a biodiverse free-for-all. They need a near vacuum of diversity and competition to really get rolling, and the toxins in close quarters enforce the near vacuum (bacteria farms). 2. If you have brown and green photosynthetic stuff, and put them in sunlight with plenty of nutrients, what happens? Also interesting is what is definitely NOT happening in the beakers. There are no signs whatsoever of pods of any kind. Not saying pods eating dinos isn't important elsewhere, just saying it ain't happening in these beakers. I have a massive plague of what looks just like ostreopsis right now. Since my tank has always shown low phosphate and nitrate I am trying the "dirty water" method. How long will it take to work, if it does? I have greatly increased feeding for about a week and a half and haven't seen much other than more dinos. I don't know how much longer my gorgonians are going to survive. Can we conduct a quick survey of the type of lighting everything is using? Update from post 2696: My Dinos have been in check ever since I installed my UV sterilizer. They are very manageable. Corals are not bothered by Dinos anymore, all are open and happy and got color back I thought was lost to months of Dinos bothering them. There is just a slight brown dusting on the sand floor and they do not gather in numbers enough to have the strings at all( no Dinos on the rocks). Still trying the dirty method currently with PO4 at .10ppm and nitrates at 8ppm. Even did some water changes with no significant Dino increase. However, Dinos have been on the rise in the last few days. This coincides with my Return pump impeller breaking (new impeller in the mail). My UV sterilizer is offline as well since it is fed from a manifold from my return pump. Dinos has doubled in 3 days. At this rate my Dinos will be back to the numbers they previously were in a matter of a week or two. When the impeller gets in I plan on doing a 2 day lights out with UV again to get them back in check. So far while we come up with a real proven solution, UV is an excellent bandage and its let me not worry about Dinos even though they are still there in small numbers. Use the window the UV has given you to add back diversity. Added Seachem stability for the heck of it. My pod population has exploded i attribute that to going dirty... they are every where even during the daylight hours. I have not added pods since the initial cycle was done last March. Thought about adding phyto but haven't yet. I'm kind of just riding the wave. Honestly if they stay at the levels with my UV running im more than happy and call it a win. Do you have a fuge, chaeto? I've had success with chaeto and ATS as incubators of life. I also run a system that's free of mechanical filtration (except for my skimmer, GFO and carbon) - no sponges, meshes or nets. So update on my situation. Dirty method 3+ weeks adding mb7, bio spira, phycopure, phyto feast, mysis cubes, and Cyclops cubes...dinos seem to be retreating a little. Downside is some of the sps rtn'ed..but others seem fine. My chaeto exploded and my fuge is full to the top. Pod population is great also muniid pods are increasing and populating my fuge. Anyone else's chaeto explode during dirty method? I have already ruled out light types, color and intensity years ago. What is left for comparison are uncovered Metal Halides for UV properties. My dinos grow fine with one 80W T5 bulb or 1000W of T5 and MH. I have MH and UV/RB LED. For a period of about a month, the glass on the double ended MH bulb was off (not intentionally). This was before there were any corals in the tank - and the rocks at the very top were completely bleached dead due to the UV radiation. It was like a complete elimination of all life... not even algae could grow there. That may have been one of the causes of the dino flareup... lack of life... I'm sure the surface water plankton was decimated by day.